The new SureColor SC-F2100, which will replace the existing SC-F2000 model, is capable of making high-quality full colour prints on a range of items including T-shirts, sweatshirts, polo shirts and tote bags. It offers a host of enhancements and new features including improved speed and reliability, and the ability to create your own print designs using Epson’s Garment Creator software. 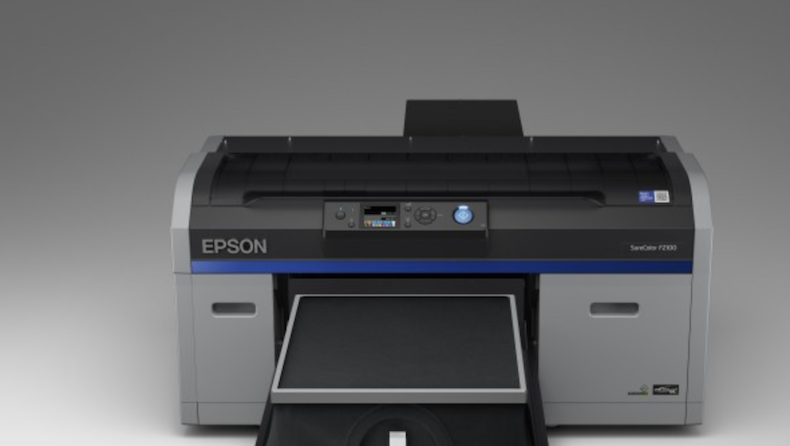 The printer provides a complete Epson solution including printer, print head, ink, software and warranty, meaning the user can be assured that all parts have been designed and extensively tested to work optimally together. It offers speedier results than its predecessor, with additional fast print modes and improved ink circulation for quicker start-up, and incorporates improved screening for smoother reproduction of images and a wider gamut than the previous model. "Our first direct-to-garment printer was a great success, so following it up was always going to be a challenge," commented Epson UK sales manager Phil McMullin. "With the SC-F2100, however, we’ve managed to improve in every area – it’s faster, higher quality and more versatile, with software that makes it easy to create unique designs. And all of that is backed up with quicker, easier maintenance." Epson’s versatile Garment Creator utility is available for free with the SC-F2100. The software allows users to add text and multiple images, create user presets for image adjustment, and provides a hot folder and CMYK image support. The SC-F2100 has an auto-maintenance mode with a separate cleaning cartridge to substantially reduce scheduled maintenance, as well as a dust catcher to prevent fluff and dust on the print head. It comes with an optional fabric platen grip pad and platen grip tool to make garment placement easier. Industry members keen to find out more about these new launches and other new developments from Epson, can visit the manufacturer at FESPA global print expo. Visitors will have the opportunity to speak with their representatives and technical advisors about the technology, as well as its wide range of other digital print solutions that it has on offer. Epson will be at the stand D20 in the Hall 2.2 at the global event, which this year will take place at in Berlin, Germany, from May 15-18. To register for the event, view an up-to-date floorplan and find out more about the various special features that will run at FESPA 2018, click here to visit the event’s official website.